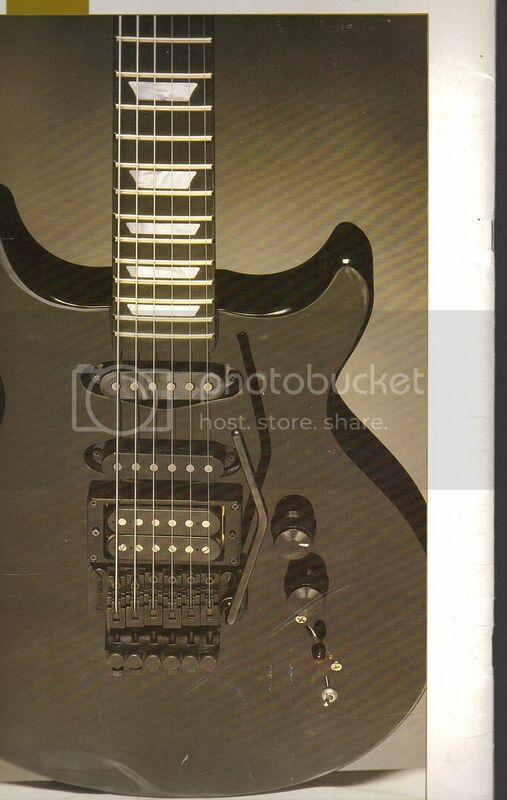 So far what I have found out is that it is a 1986 Custom shop model with an EMG 85 pickup in the bridge. Is this correct? 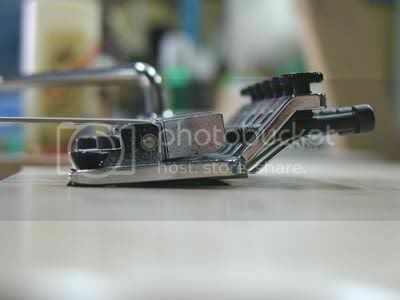 Was there an officel model number for it? 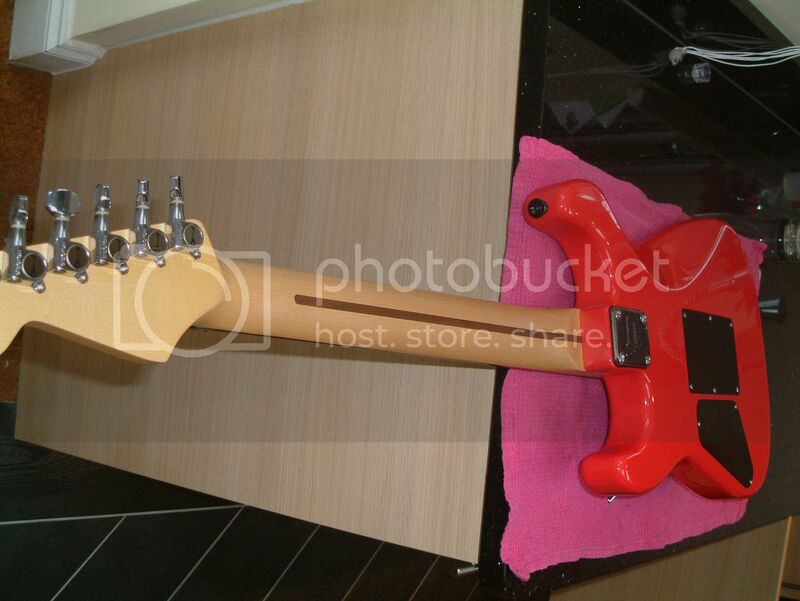 Anyone know what happened to the guitar? 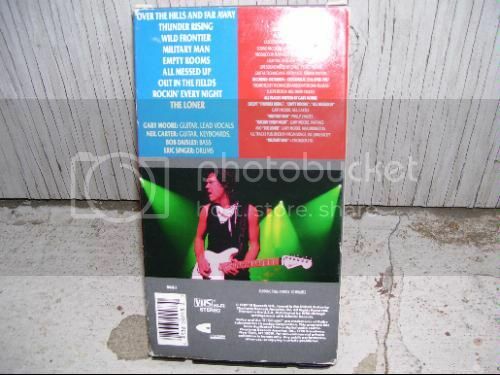 A few years back, I asked a family member about Gary's old '80s Charvels and was told he still had them. I believe the member Emerald can give you some info on them. Do a search as he has posted some info on them in the past year or so. 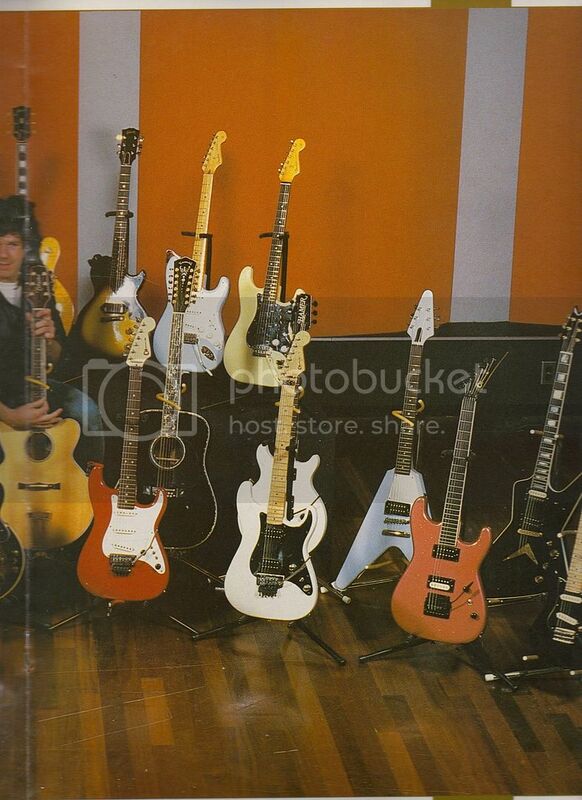 I think Gary had a few Charvels that he mix and matched parts on, changed out pickguards etc over the years. 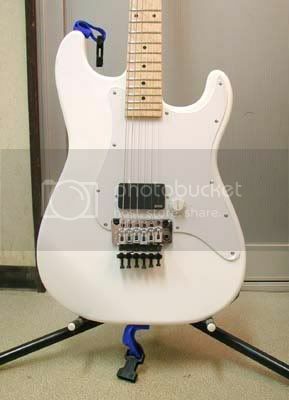 Here's a white one - maybe Charvel should put these out as Gary Moore models or make them Wildcards. 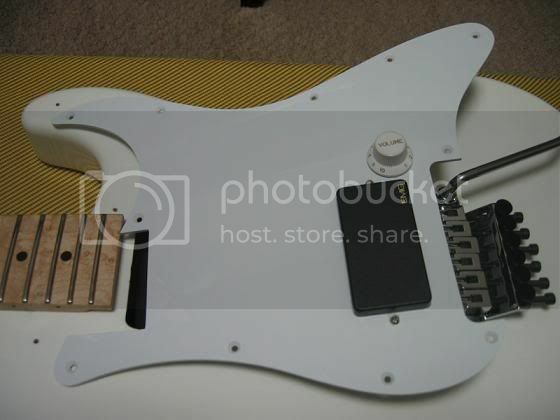 Well, you can always take a white so-cal and put in a new 1H pickguard with an EMG. 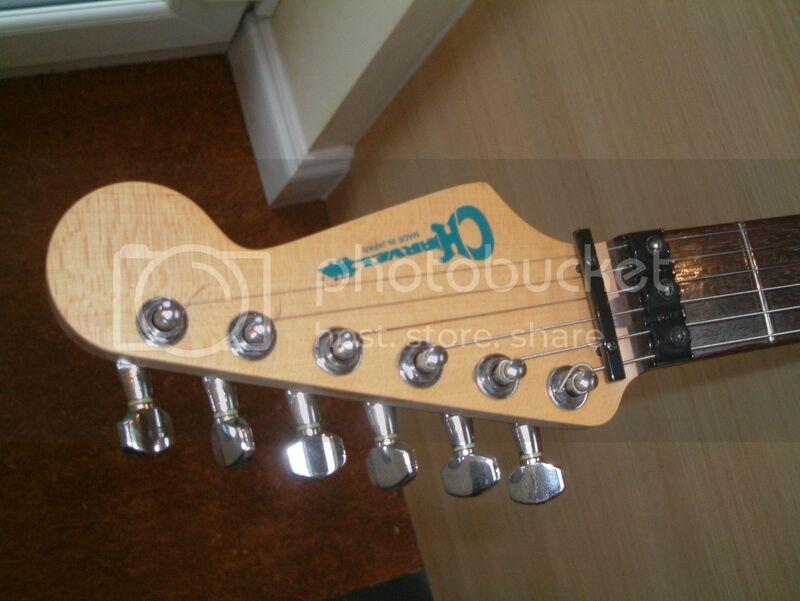 You won't get the matching headstock or body edge jack, but it would be close. 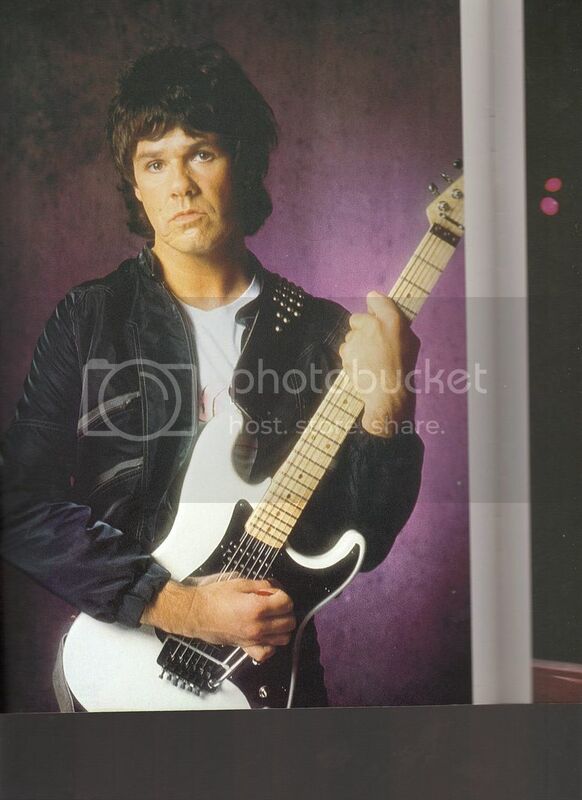 Gary indeed had two Charvel San Dimas guitars, but they ended up being modified by Gary's then guitar tech Keith Page form their original configurations. 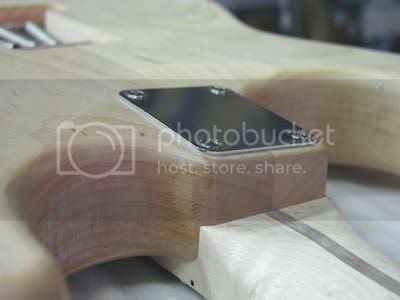 The finalized guitars were not built by Charvel then. 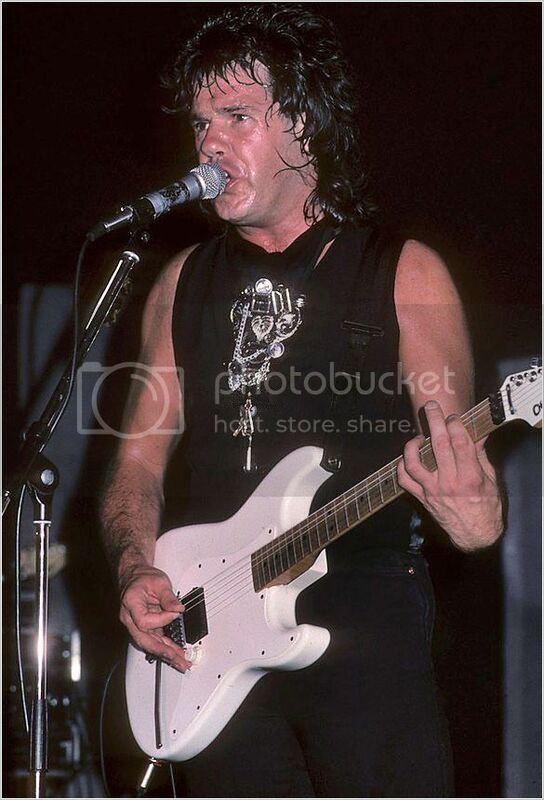 The white bodied, white headstock guitar started out as a double humbucker top mount OFR with chrome hardware, but a black anodized R2 nut. 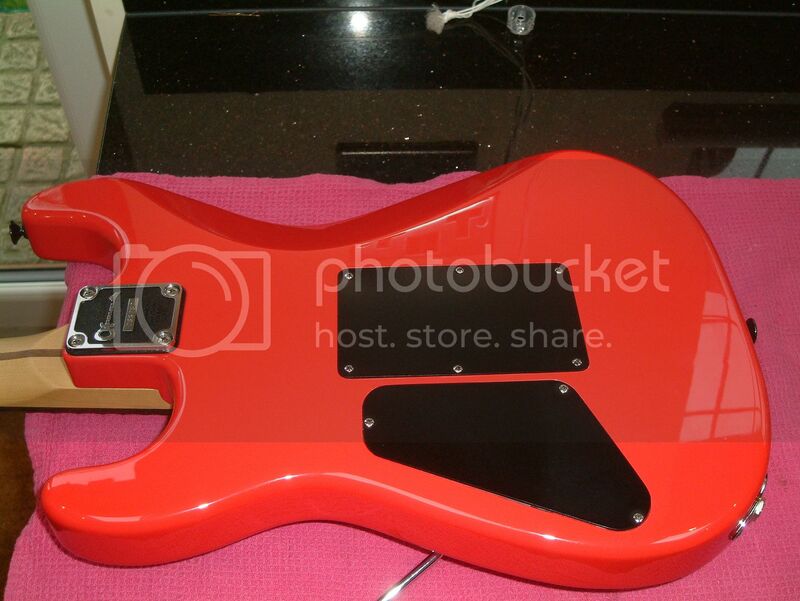 Both pickups were removed and a Strat single ply pick guard was fitted. 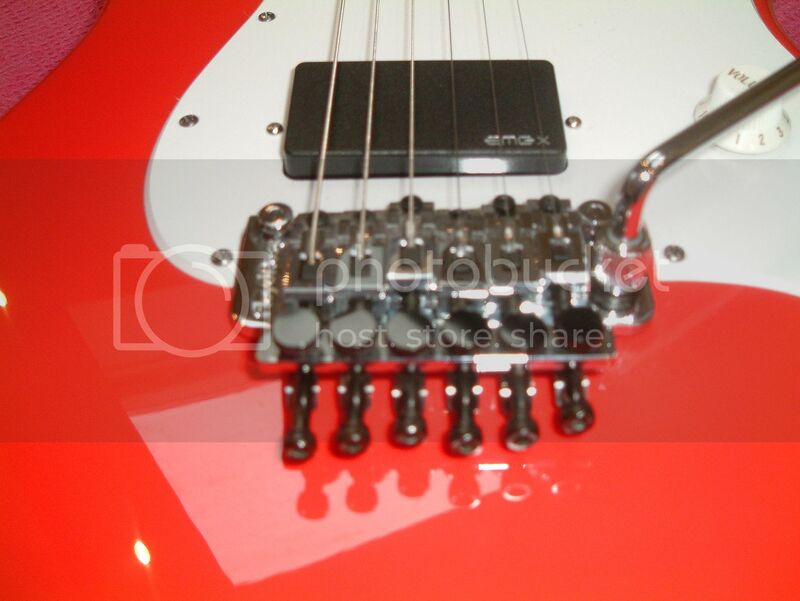 with the EMG's electronics and battery placed in the space where the on a normal Strat, the two tone controls would be placed. 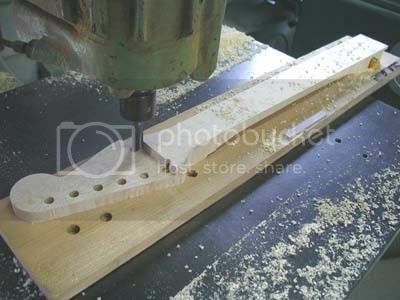 Years ago I found construction photos of a replica guitar built by a Japanese luthier which reveals most of the build features. 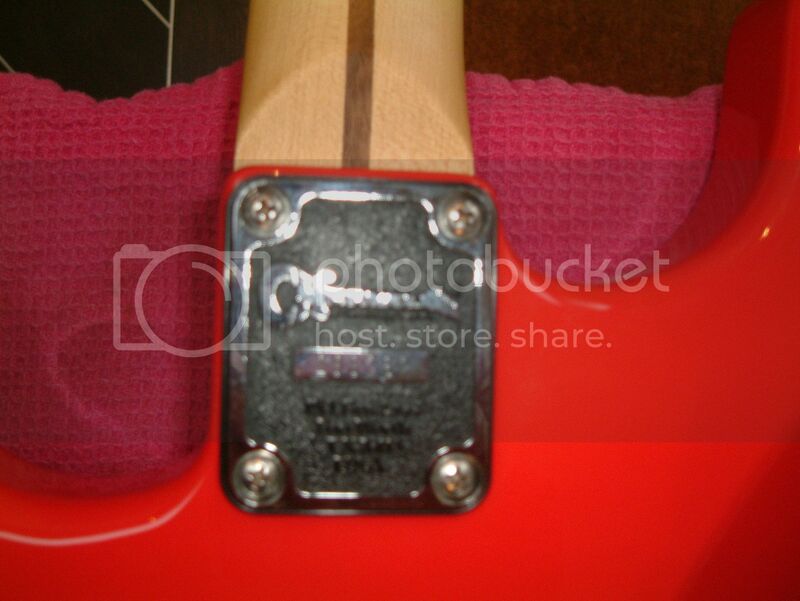 The neck pickup was removed and in the bridge position was placed a pick guard mounted EMG 81. 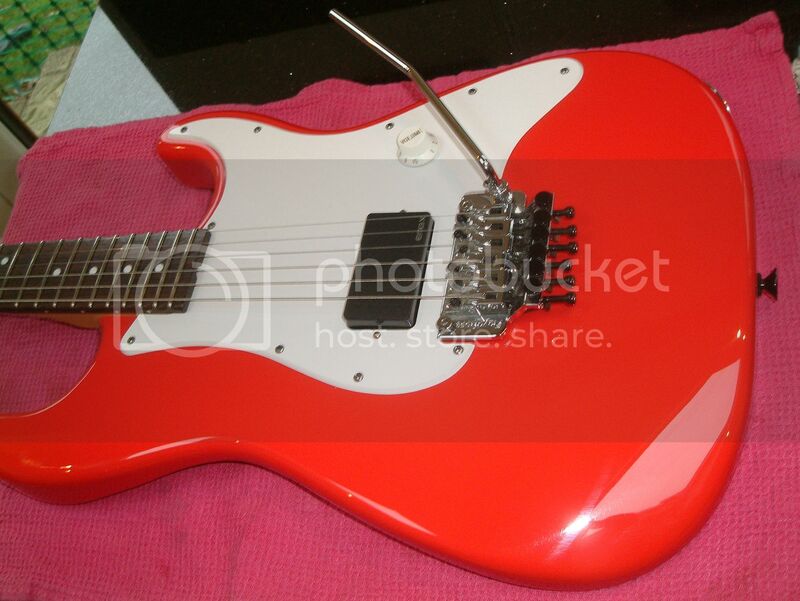 I have written in great detail about these two guitars in the past and I discovered the original guitars and put together how the two Charvel Strat heads evolved. 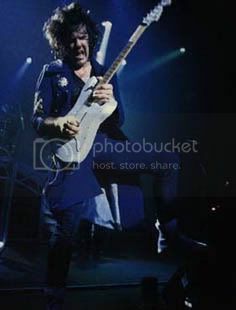 The white guitar has a maple fingerboard which was replaced by a Jackson logoed replacement neck with a rosewood board for the 1989 "After The War" tour. 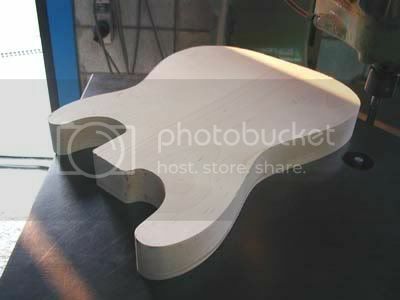 This is the guitar before the modifications. 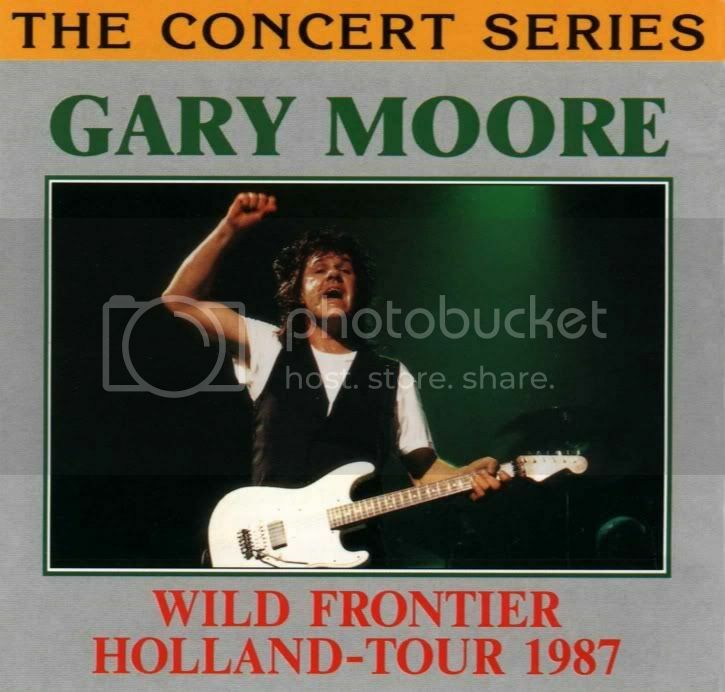 I believe the empty neck pickup rout adds to the acoustics of the body, giving the guitar it's ethereal tone best heard on the song live "The Loner" form the 1987 "Wild Frontier" Stockholm, Sweden show. Last edited by Emerald; 04-21-2013 at 05:03 PM. 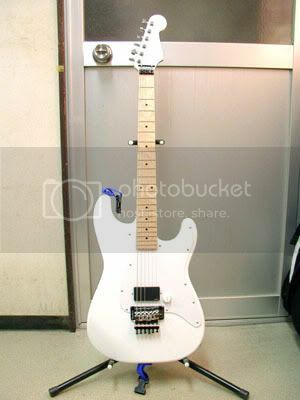 Here are the pictures of the Japanese replica being built, theoretically these two guitars could be ordered from The Charvel Custom shop as they were modified from stock when they were first built and were not built for the artist by Charvel as they ended up. Last edited by Emerald; 04-21-2013 at 05:06 PM. Last edited by Emerald; 04-21-2013 at 05:01 PM. 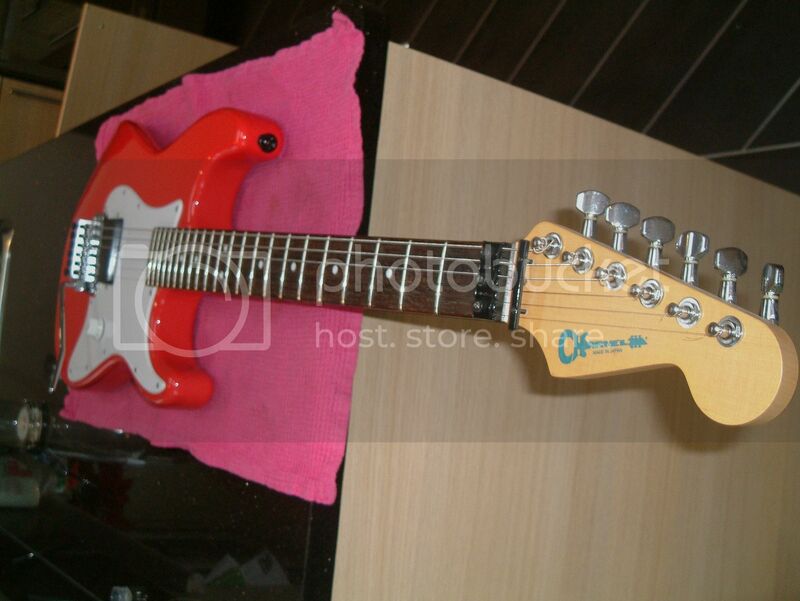 The construction of the red Charvel would be very similar. Here Gary describes the rebuilding of the two Charvels which he loved and no they no longer belong to his estate, one was raffled off in a charity auction many years ago (the red one) and the white one which was re-necked as I stated, I have no idea who ended up with it. Last edited by Emerald; 04-21-2013 at 05:09 PM. 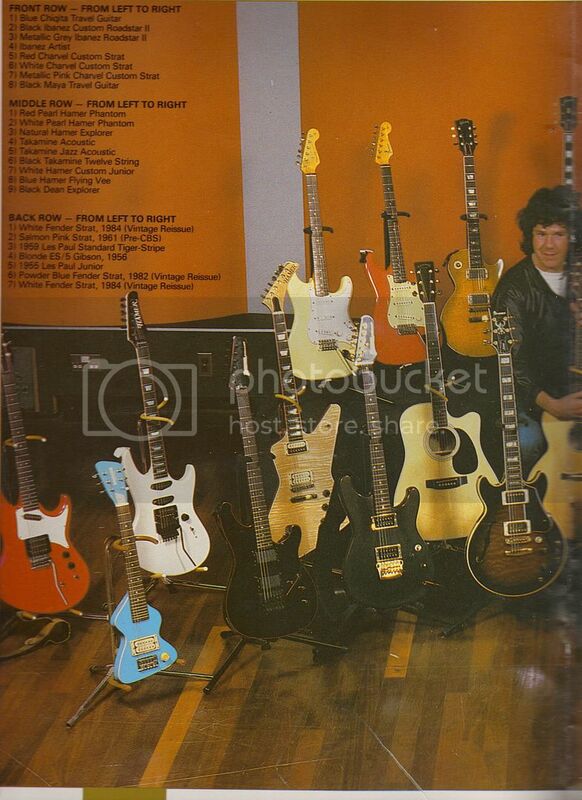 In this group shot of Gary's guitars from his 1985 tour program the two donor Charvel's can clearly be seen. 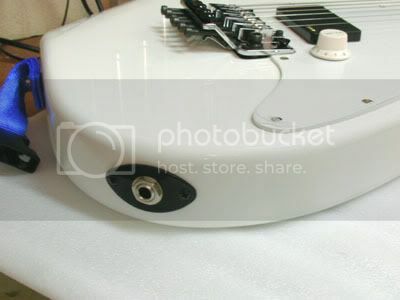 Both guitars are top loaded with the side output jacks.. 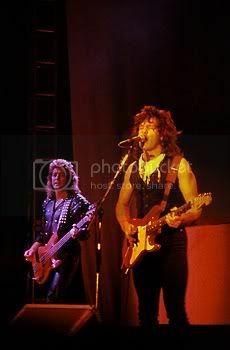 Some writing by me on HRI forum about the WF era, ect..
Also in 1985 Gary had visited Jol Danzig at Hamer and they built him a few special specification double cuts. 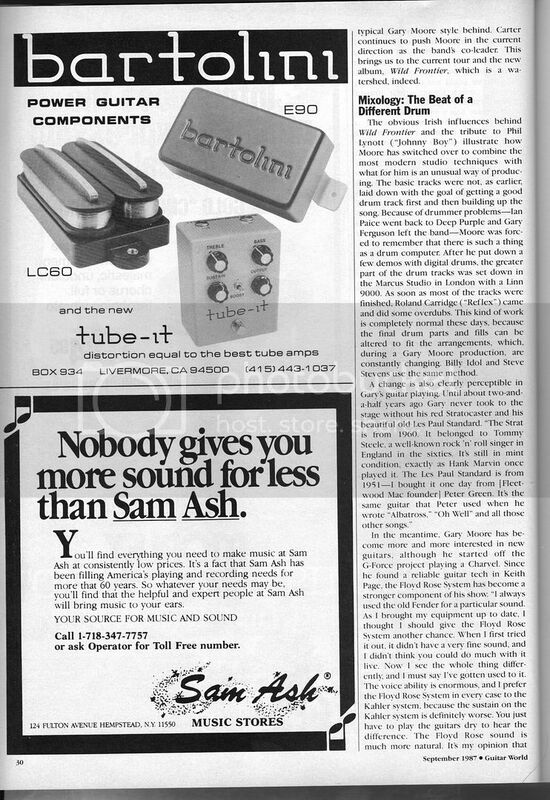 Just this month in September's Premier Guitar, the Jol Danzig column details Gary's infamous visit to the Chicago factory and he brought Greeny along and Jol was hell bent on disassembling the iconic guitar, to seek the magick mojo of the mid position PG nasally, haunting tone, that added with Peter's judicious use of reverb, made his trademark tone. 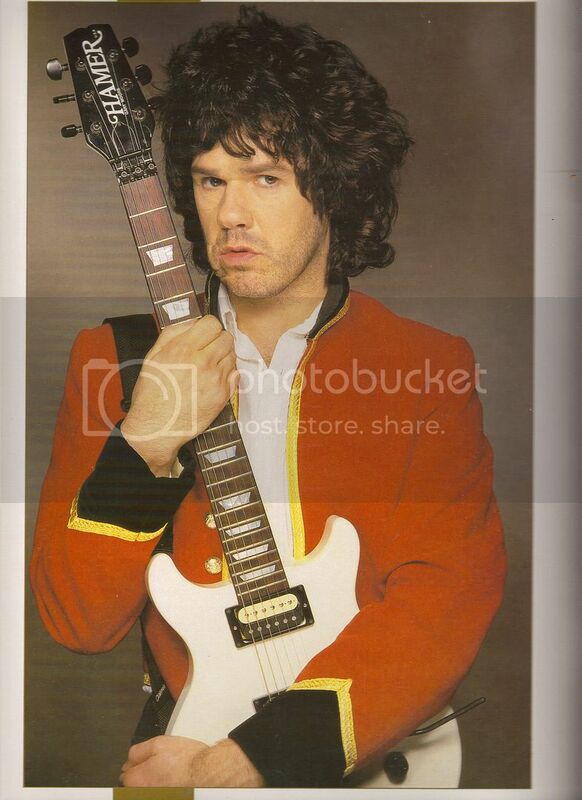 In reality PG would switch as much as 4 times during the course of a Fleetwood Mac tune, obtaining a familiar PG sound but changing it up to suit his mood. 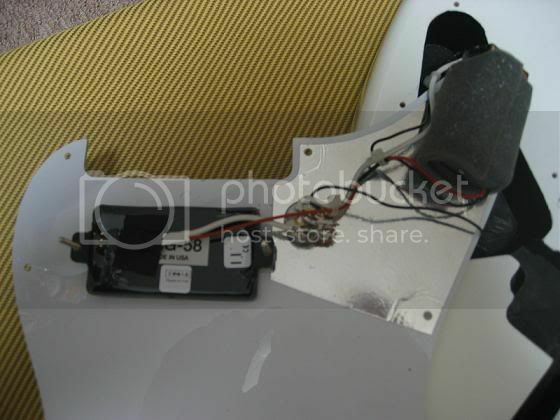 When Jol disassembled Greeny, removing the pickup covers and inspecting the wiring, which was stock. 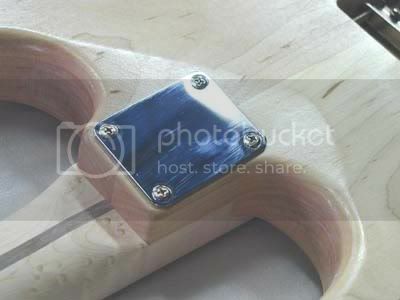 He eventually used a compass to determine that the neck pickup had one of the magnets, 'flipped' or reversed, and the guitar left Gibson that way. Joe Bonnamassa's recently acquired 1959 Standard apparently exhibits the same characteristics, these changes are mega, mega rare.Gary would use the Boss Distortion with the 1959 LP Standard Greeny (ex-Peter Green) for usually the set closer "Parisienne Walkways", the Boss boost/distortion allowing Gary his trademark extended note parts. 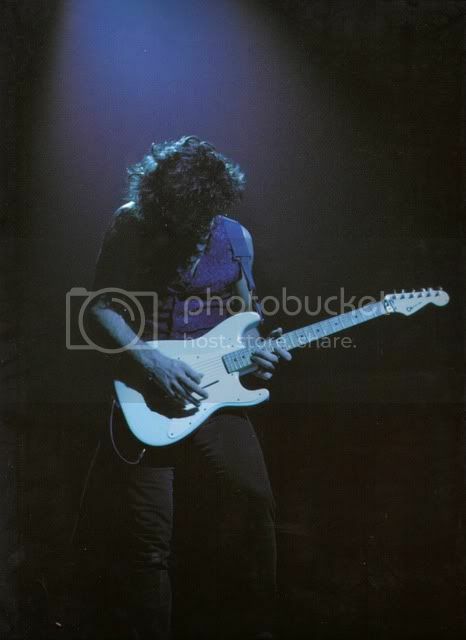 He described the Boss pedal as giving the Strat's in particular a good kick up the arse, to boost the gain on the relatively weaker output stock '61 pu/s and the reissue '62-'57 pickups as well. 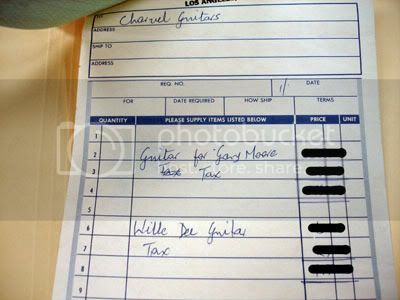 Over on Charvel USA forum, one of the mods detests the amazing Fullerton reissues, saying back in the day he couldn't flip them fast enough. 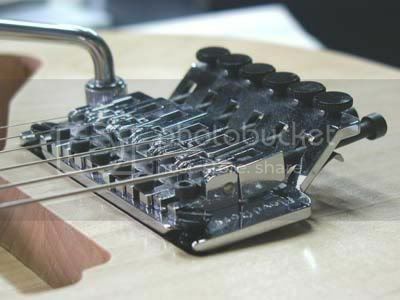 I have a 1983 very low V00 number black '57 reissue, that I special ordered from Chuck Levin's Music Center in Maryland. 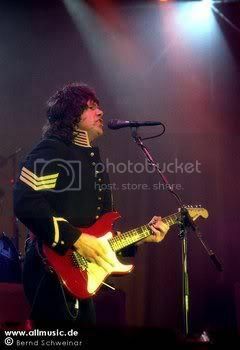 I called it Blackie back then, prior to all the recent spate of signature model Stratocasters. 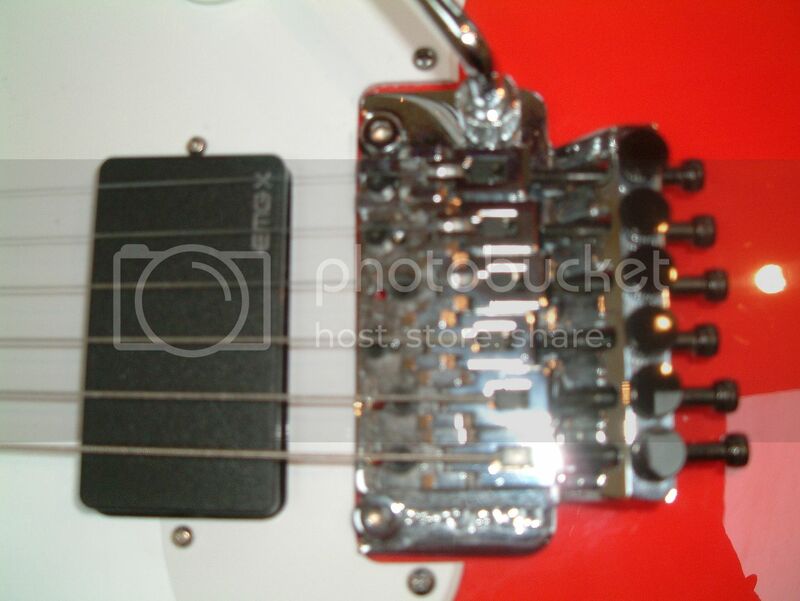 I never used the tremolo and tightened down the bridge tight to the body. 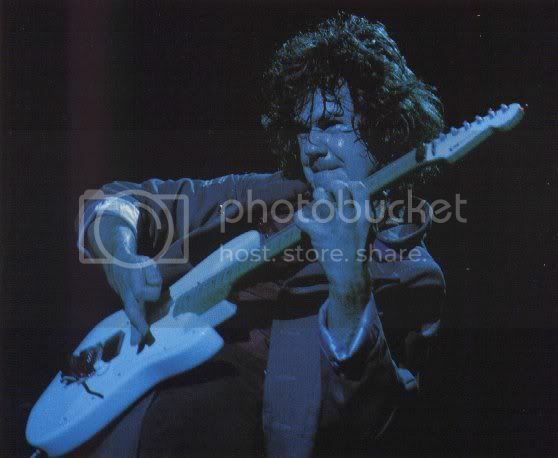 Now Gary Moore has always played with extremely high action, even on the "7.25 radius Strats. 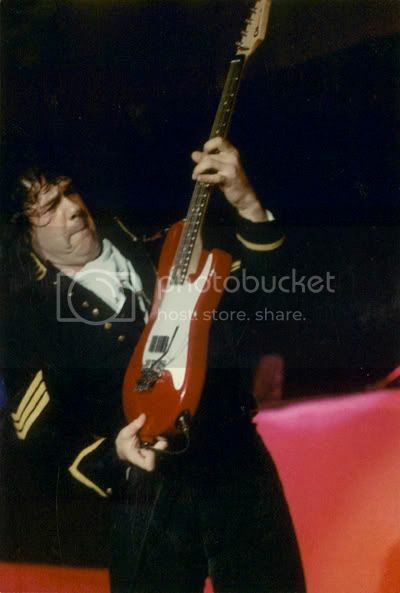 His guitars are virtually unplayable by others, yet he frequently bends up to 2 and a half step bends, all the while maintaining incredible centering of the note and magical vibrato. 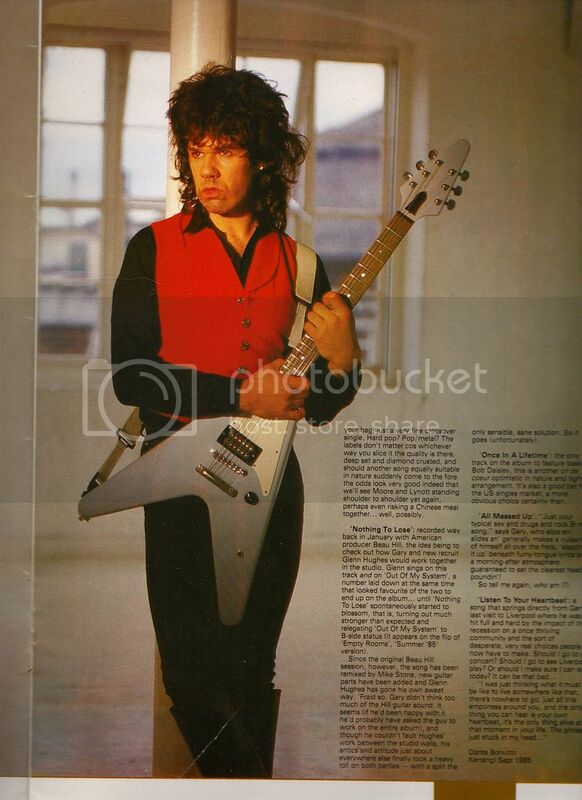 Recently I complimented young Jack Moore about his killer vibrato. He thanked me and remarked that his father spent a long time with him perfecting what is always the players trademark component of his arsenal of playing techniques! 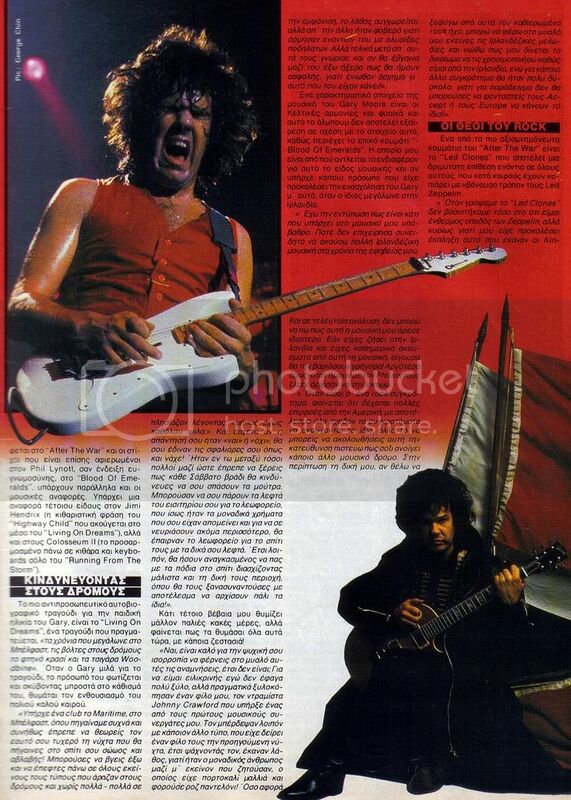 Now on to the 1987 Wild Frontier live stage setup, which to me as a dyed in the wool Gary Moore devotee, mega-fan, what have you, is the zenith of Charvel/EMG/ Original Floyd Rose playing. 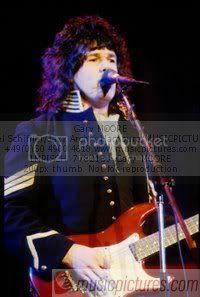 Gary had really dialed in the massive stadium rock ultra tone, with each chord and note verging on the brink of feeding back. Gary had two Charvels back then. 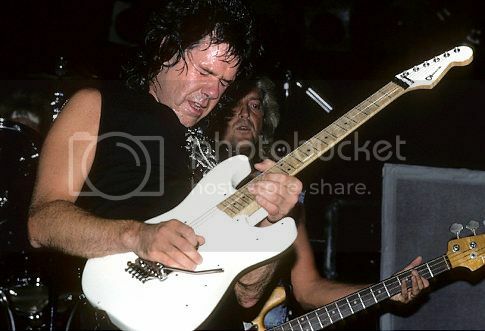 The pearl white bodied Strat style Charvel had a maple board and at various times on the world wide tour he would use the white one for the closing tour de force, "The Loner", originally performed by Clem Clempson on Cozy Powell's LP either Tilt or Octopus, it's late forgive me, one of those. 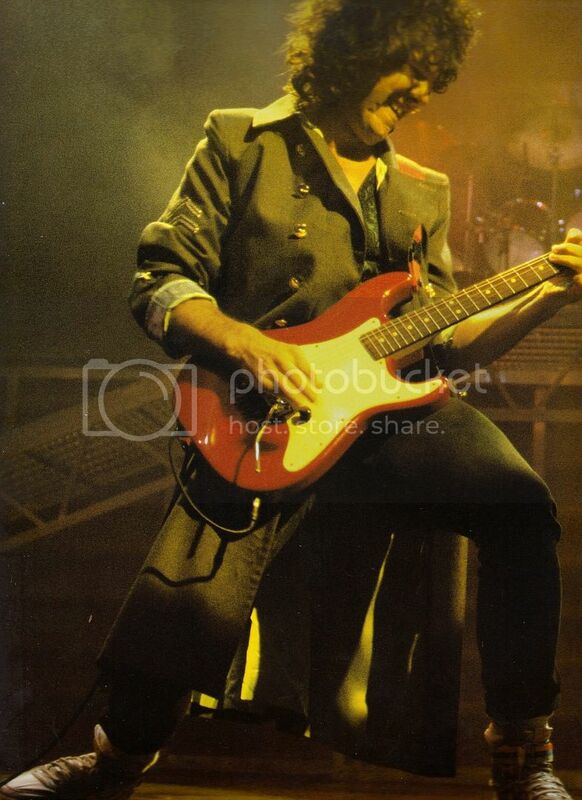 I have a boot video from the Chicago Ritz performance, where Gary uses the white Charvel as the primary guitar and uses a Jackson Soloist for the occasional tune. 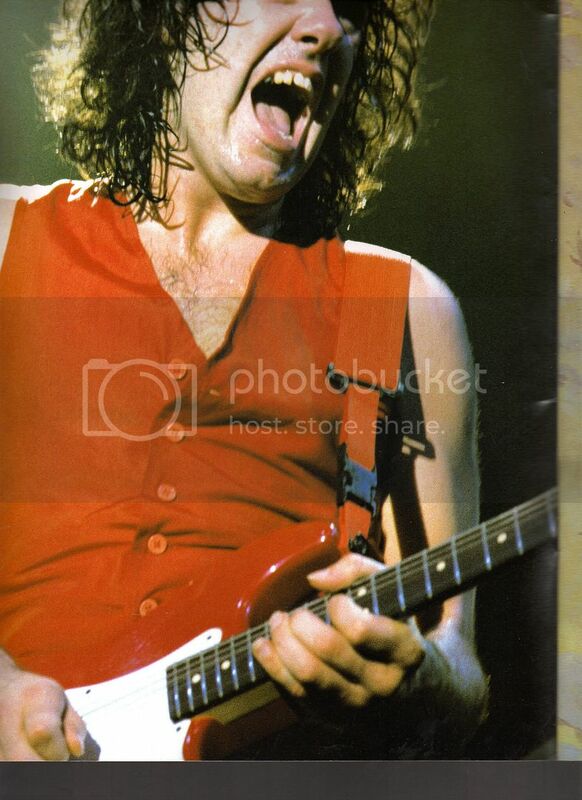 But for the majority of the tour,Gary relied on the pearlescent red Charvel with a rosewood finger board and a walnut skunk strip.I am led to understand that originally the red guitar had an EMG 85 in the bridge, but this was changed to an EMG 81 later to match the white/maple guitar, which had an EMG 81 all along. 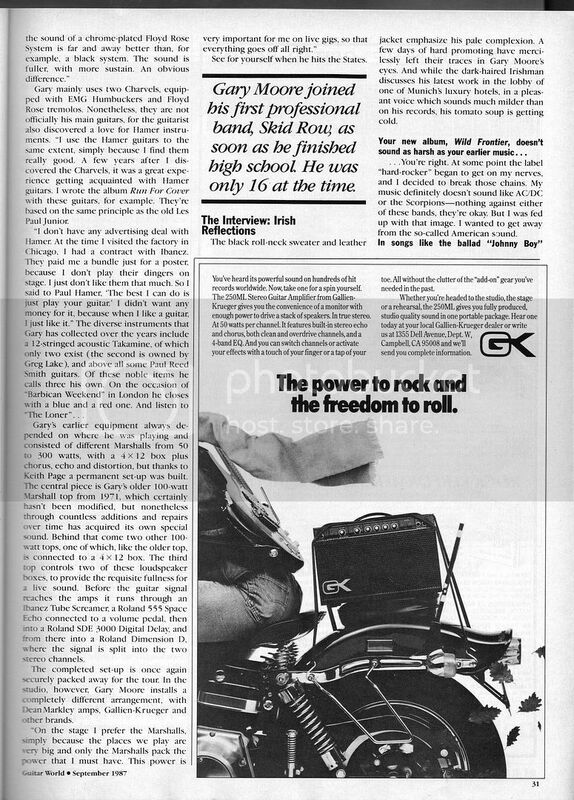 After extensive research through USA Charvels, and the investigation of a replica of the white version built by a luthier company in Japan, Guitar Works, I later found out through a previously unavailable GM interview in German of all things, Gary revealed that Keith Page his mighty guitar tech had assembled the two Charvels by bastardizing components from existing Charvel Strats that Gary already owns. 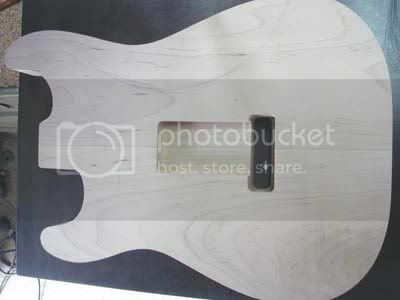 The white/maple guitar was constructed first and Gary couldn't put it down at all. 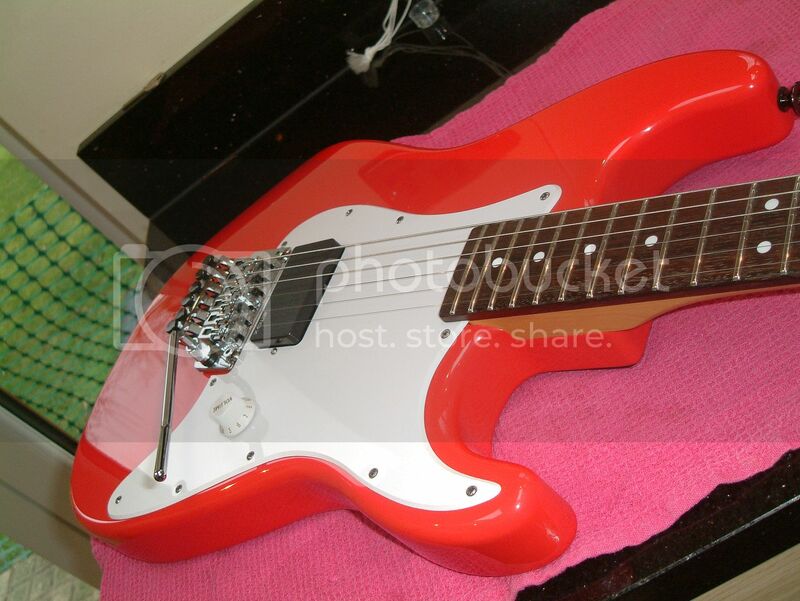 So the red/rosewood model was built later to the same exact specs. 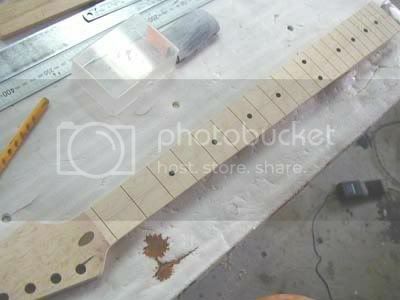 The rosewood board giving a different frequency response, to the moore trebly bright sounding maple neck. 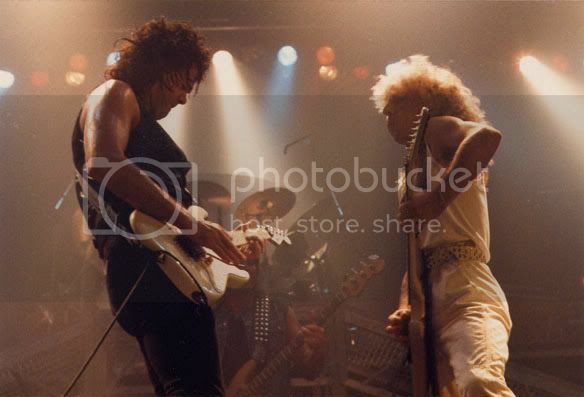 These Charvel superstrats are unusual in that I believe the white one was built from a white/maple black pick-guard, double hum bucker routed guitar.This is easy to spot as the white one has chrome hardware, but a black anodized locking nut and it continued with this spec. 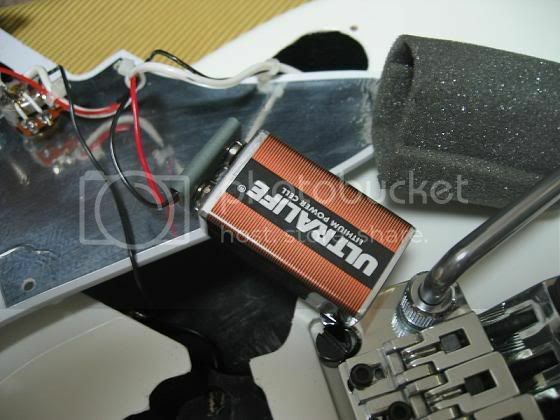 The pick-guards have a single bridge position rear loaded (from underneath the pick guard EMG 81 active pickup), I believe the single volume control which is mounted on the stock 11 hole 3-ply guard is in the original Fender type position. 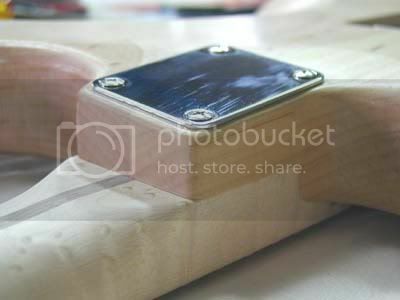 The other two control mountings are blank and I am sure that the volume pot must be of 500K resistance. The amazing thing surrounding these two guitars and fairly true of all Gaza's guitars, has fairly high action. Prior to his unfortunate left handed, severe injury to a digit, which became severely infected, actually severely complicating Gary's life, so rampant was the nfection. 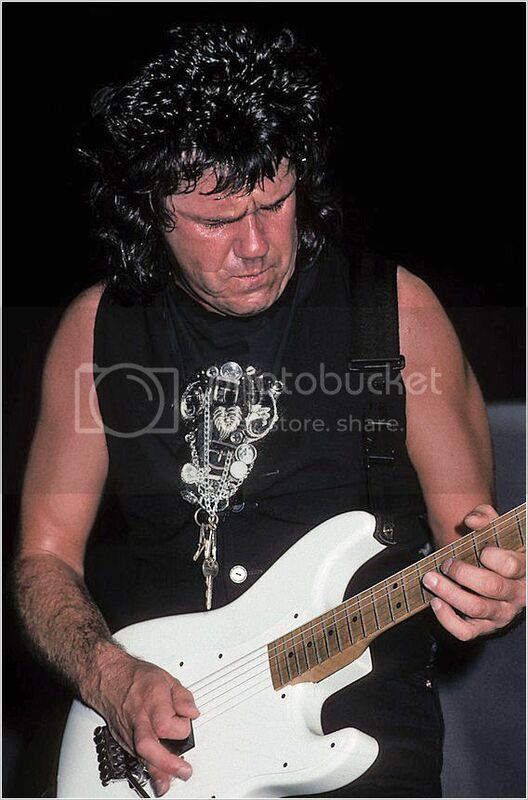 Prior to this injury, which took place in the 2000's, Gary always used in standard A440 tuning Dean Markley Light-Top Heavy- Bottom nickel sets. 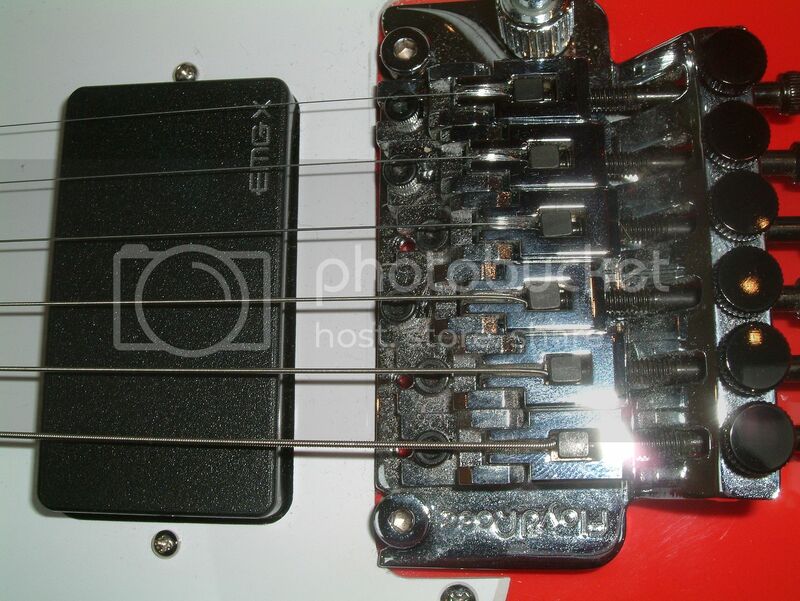 Then post accident he was forced to modify his string gauges and whole left hand approach. Now Gary is a southpaw who writes left-handed, yet plays right handed, this gives him an awesome advantage on his left hand, with major speed and accuracy. 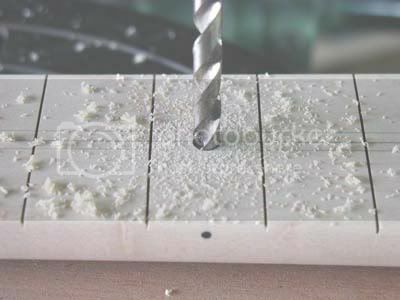 He was using a light set, 0.10-0.46 as opposed to the previous 0.10 - 0.52 gauges. 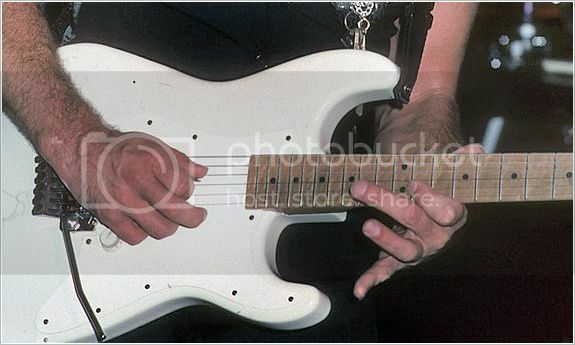 Gary prior to his death had worked his left hand strength up to accept a 0.48 low E string. Now finally on to the Wild Frontier setups. 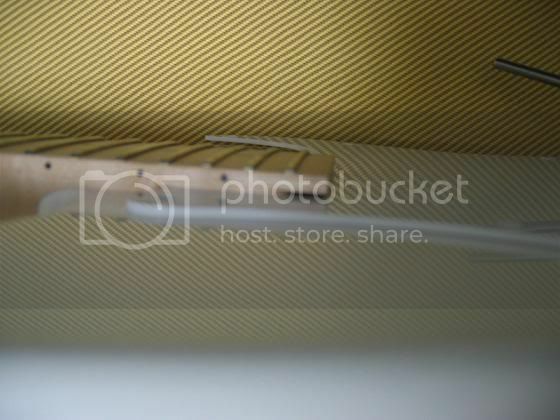 Here is a Photobucket album that has a scan of the outboard, stage placed Roland effects, in a small three tier "19 rack case..
Last edited by Emerald; 04-21-2013 at 05:13 PM. 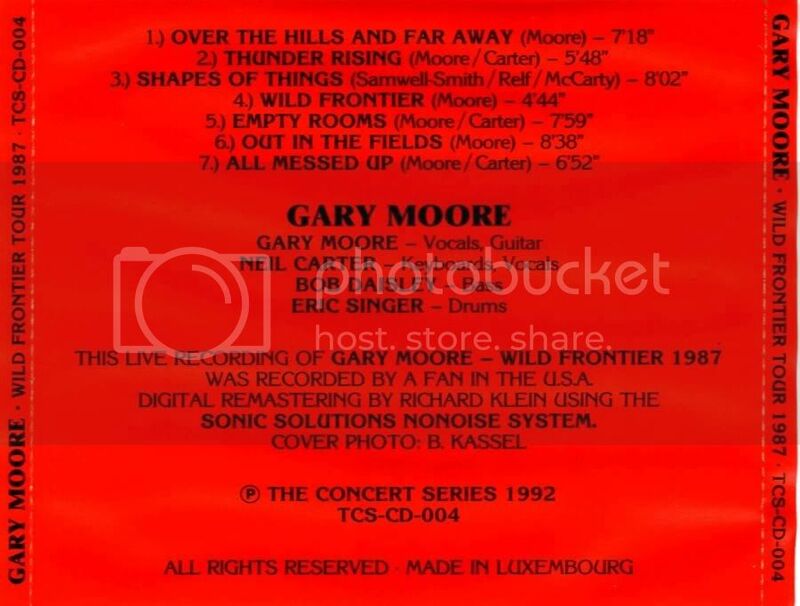 Here are some further video clips from You Tube, portraying the great 1987 Wild Frontier live tone. 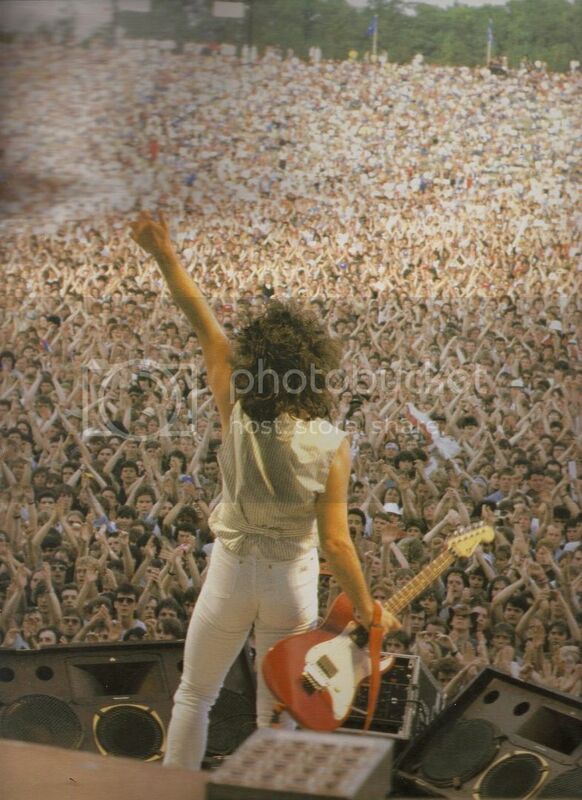 The Issatadion concert in Stockholm, Sweden has incredibly recorded and mixed guitar sound. The original release format was Stereo VHS tape and on my very expensive in it's day Mitsubishi VHS HQ player, which is broken at the moment, the transport mechanism is simply worn out..! 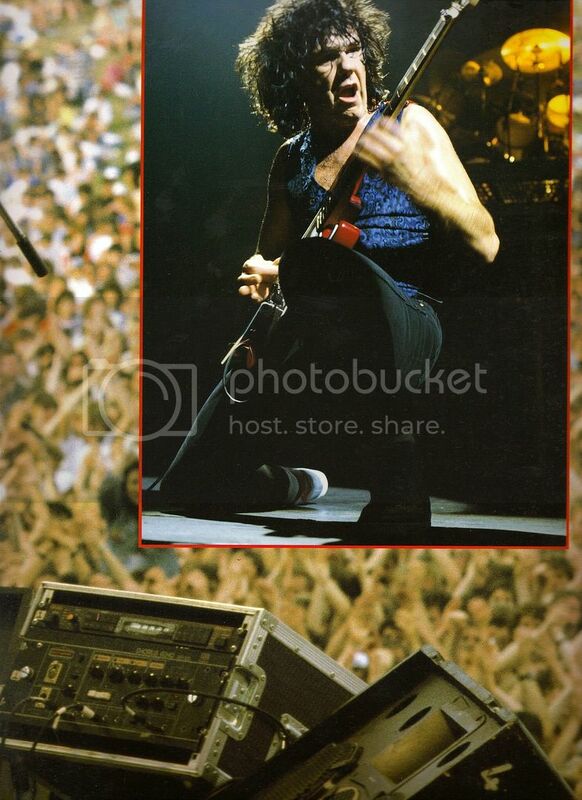 The actual sound of the VHS recording is way superior to the same material transferred to digital format. 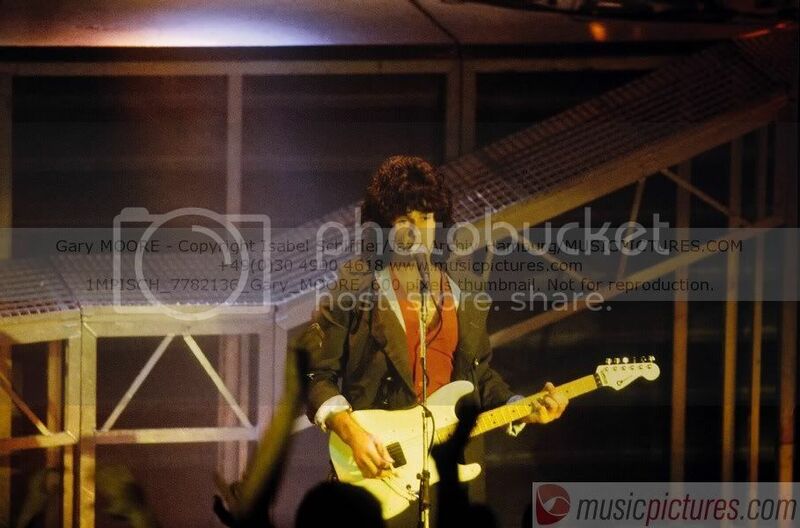 There is talk of releasing this video on DVD/CD. Unfortunately the digital transfer seems to be from a 3rd or 4th generation tape at best. I pointed this out on the GM forum and even wrote to the sound engineer, now big shot movie soundtrack producer Nigel Walker. He declined to reply to my inquiries when I asked if he was interesting in reprising his role. 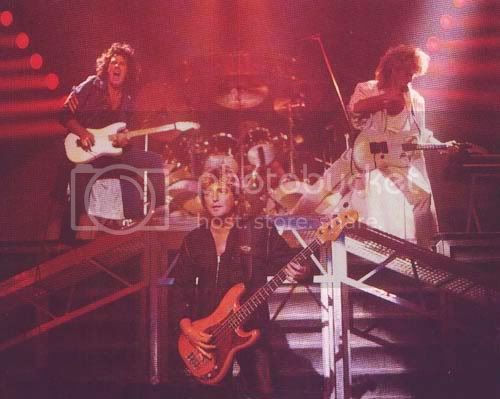 Chris 'Privett" Hedge was responsible for the live soundboard recording. The superb NFL Films Entertainment division did the filming and editing and the video has spectacular production values. 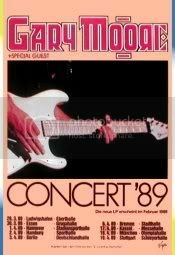 So since I have loved this concert since it's release, I feel that EMI, having received the rights from Virgin, is just rush-releasing this and not taking time to get a dub from the original master which may well be still at NFL Films in NJ and missing an opportunity to use extra bonus footage, such as "Shapes of Things" which was on the original setlist. 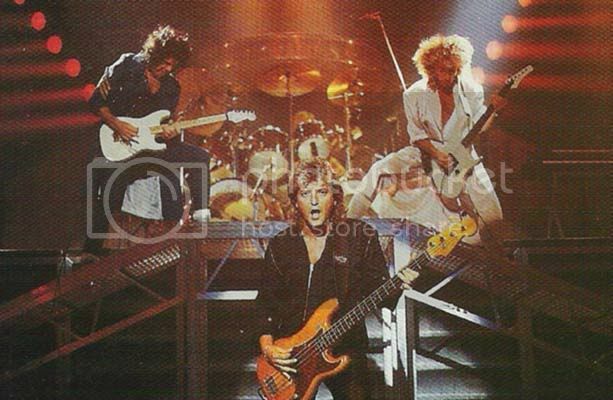 Apparently they are using extended versions of "Rocking Every Night" and "The Loner", which is restored to it's 15 minute original recording. 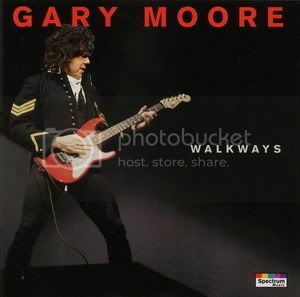 Unfortunately I was fearful that this would happen after gary's untimely passing. 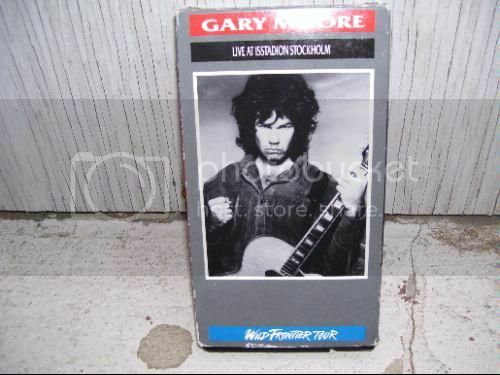 This arguably is one of Gary's best live shows ever and for it to be slammed out with no TLC, is abhorrent to me as a fan. 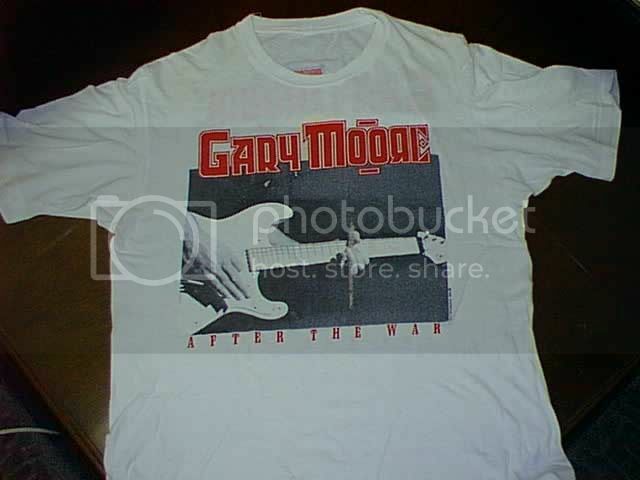 Apparently Gary's last management, which I would rather not comment on publicly, again are missing the boat on their artist. This track "Friday On My Mind" was also left off the original release. 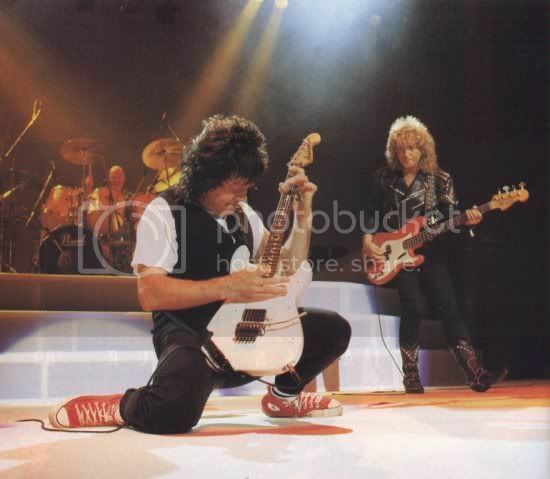 Here is the audio from the Hammersmith Odeon show of "The Loner"
One can hear the delay settings on this version easily. 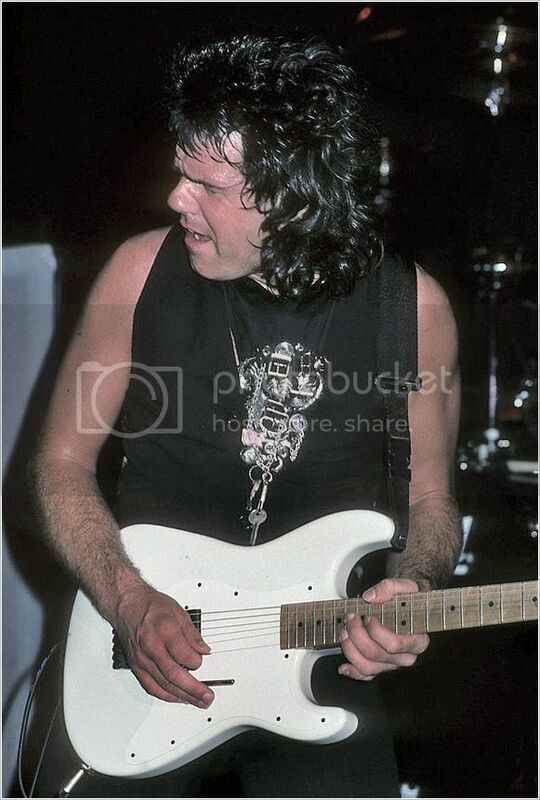 I have loads of info on Gary Moore and was quite proud to CSI the origin of the two Charvel's which are along with Steve Steven's Glow #4790 Strat Head Dinky, are my favorite 3 San Dimas Charvel's of all time!! 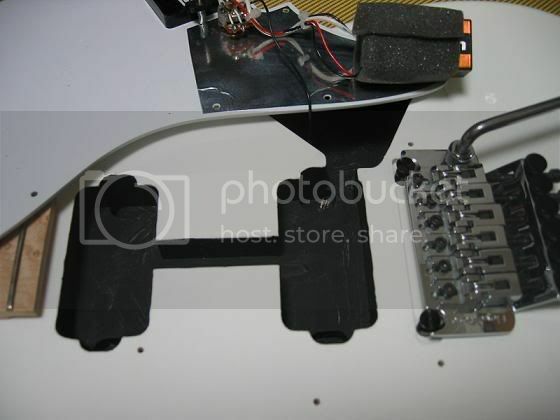 Hope this helps, the key to replicas is to locate the volume knob in the correct place using a blank Strat pick guard and using the prior control cavity for the EMG electronics and 9 volt battery! Last edited by Emerald; 04-21-2013 at 05:14 PM. Any questions?? 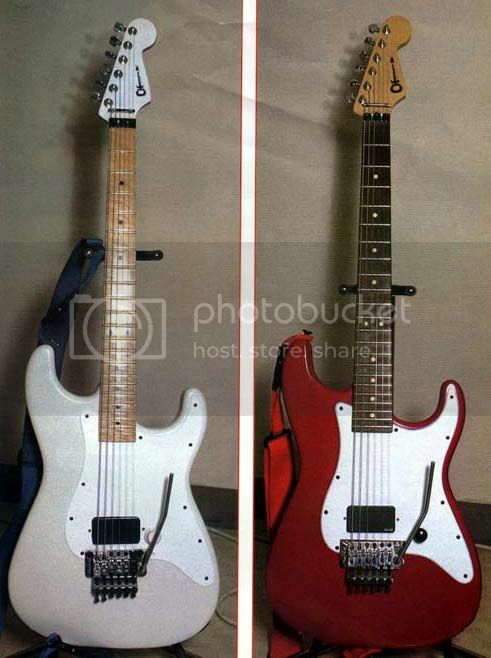 One day I hope to replicate on of these two, but the US Charvel's, now being released again aren't exactly perfect base guitars. Here is the master at work..
Last edited by Emerald; 04-21-2013 at 07:50 AM. 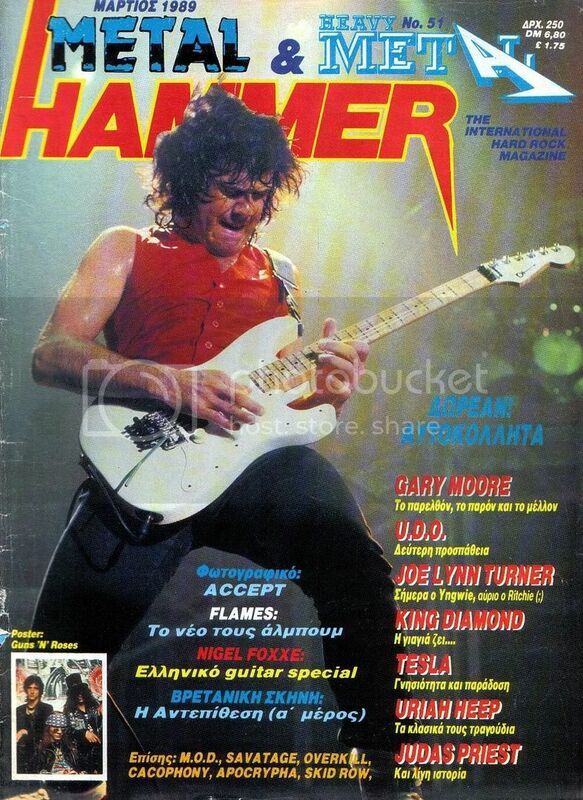 I remember that light blue Hamer V from one of his videos. 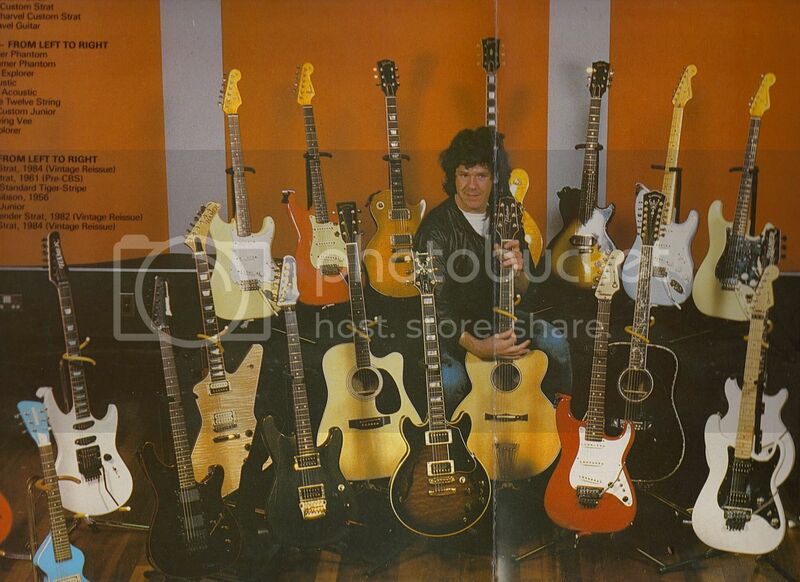 Much later on I emailed the "Gary Moore" website admin and asked if Gary ever sold any of his old guitars. 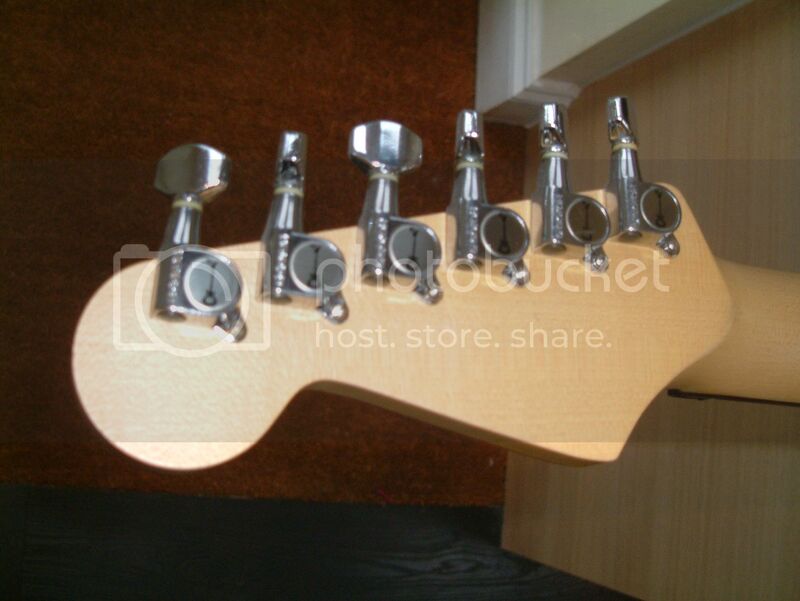 The site admin told me he would auction his "unused" guitars for charity. Man, I still feel bad that we will never get to hear new music or see him live again. 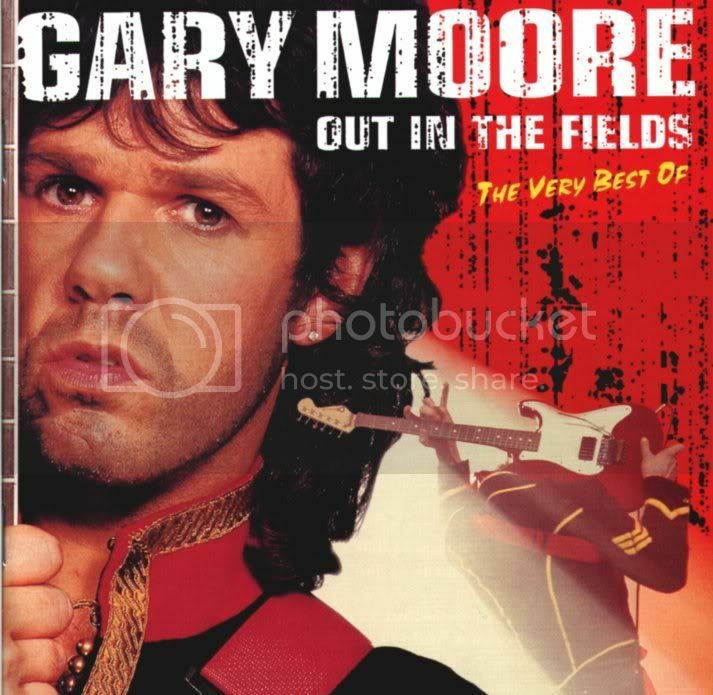 RIP Gary. 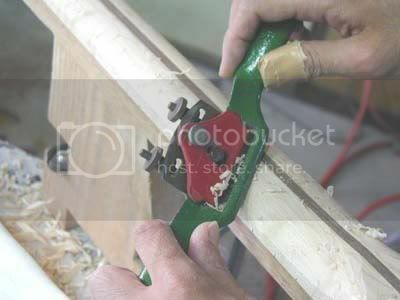 And thanks for posting Emerald. Thanks for reading, hope I was comprehensive enough!! 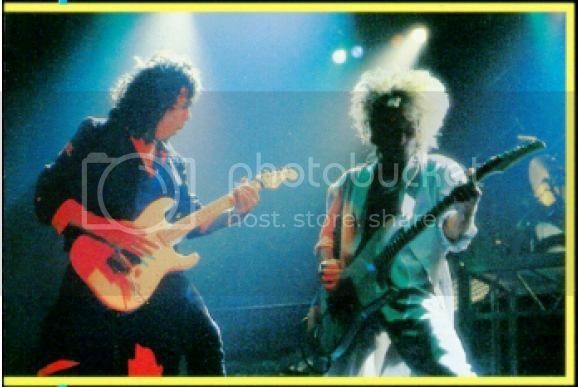 I have tons of writing available about the equipment of Gary, Yngwie and Steve Stevens as well! Last edited by Emerald; 04-29-2013 at 01:57 AM. 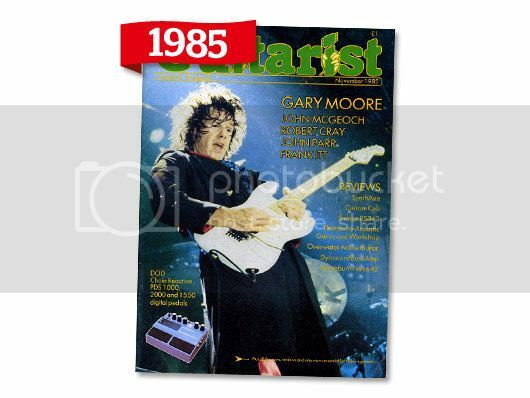 You guys are welcome, I have made an exciting new connection within the Gary Moore world, Gary's personal assistant/body guard, no not Kato from Green Hornet..lol and this is leading me to Gary's guitar tech from 1990 till the end. Graham Lilley. 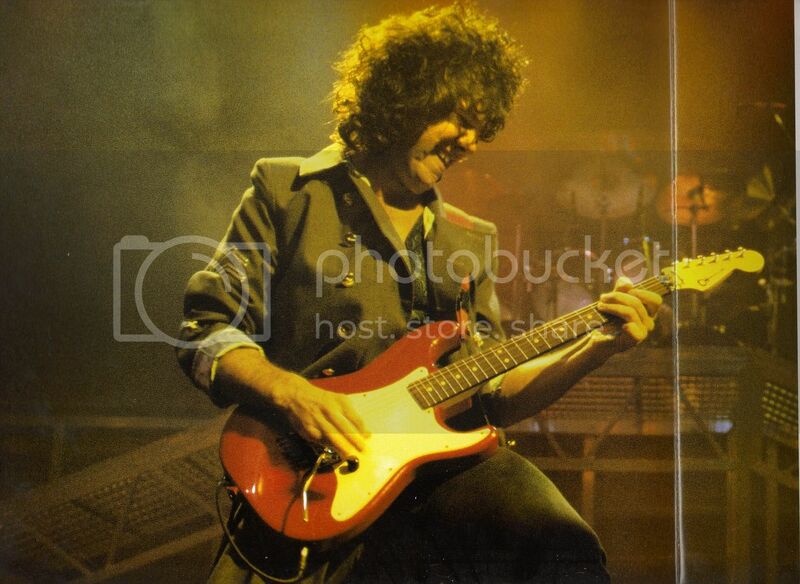 Recently some friends sent me an Ebay link with a Gary Moore Red Charvel replica. I told him to pass as it wasn't anywhere close factually, then another internet contact I know ended up buying it..small world. 2) Wrong type and positioning of volume knob, the original is farther away and is a black anodized knurled stack type knob. 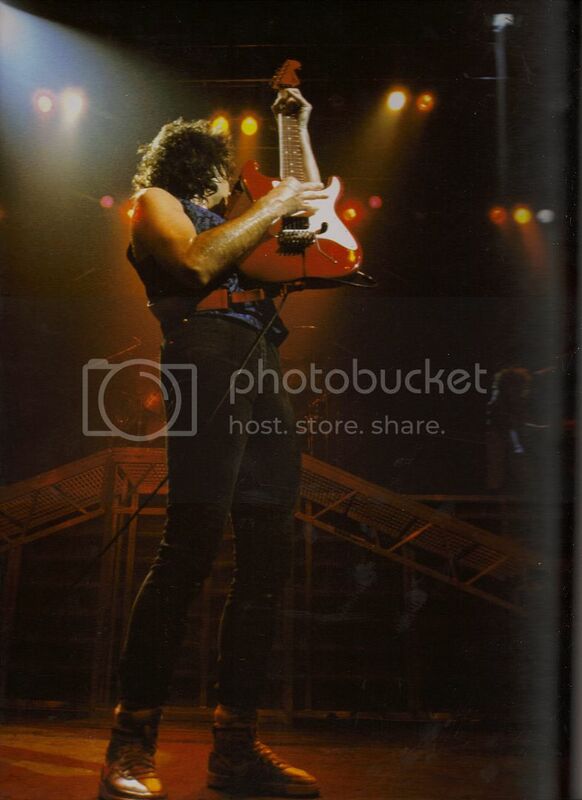 3) This guitars body is rear loaded and both of Gary's Charvel Strat's have front loading controls, ect. 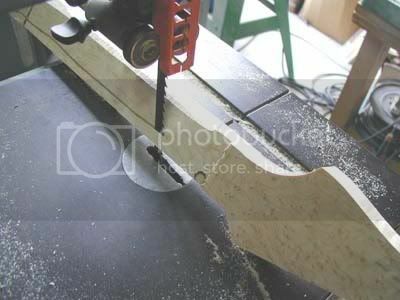 5) I think the neck profile is incorrect especially the cut of the headstock on the back leading to the neck, too angular. This is a replica in the broadest sense, so the reserve has been lifted so to speak. 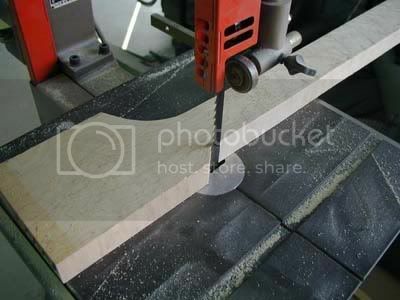 Here are some pics that were emailed to me. So in the spirit of the thing Stew the new owner likes the way it plays, ect. 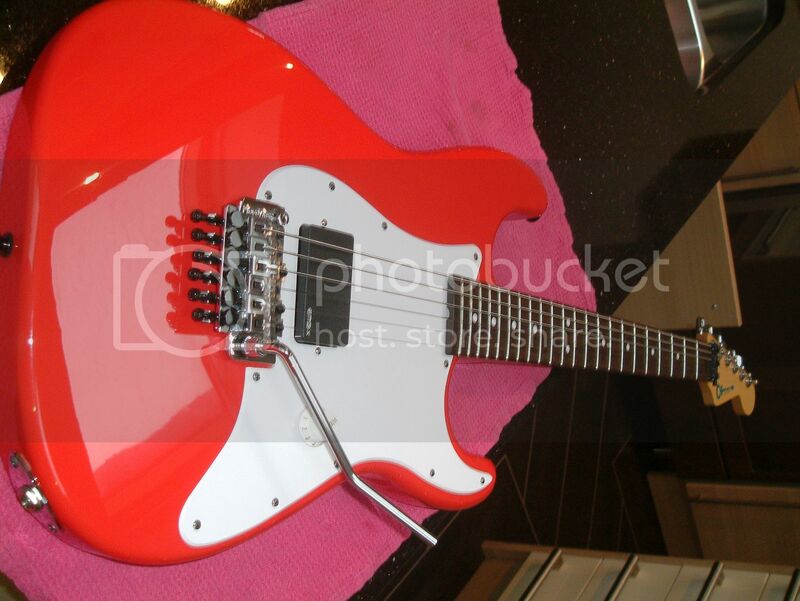 so for the purist it isn't close at all, but a good sounding and looking guitar. 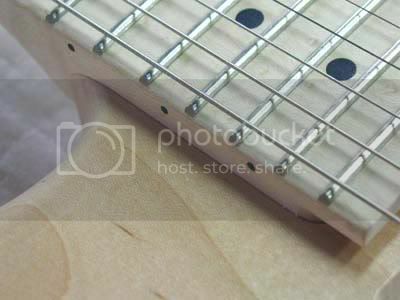 For me the original white Charvel is the one with it's Strat volume knob and it's ideal positioning. 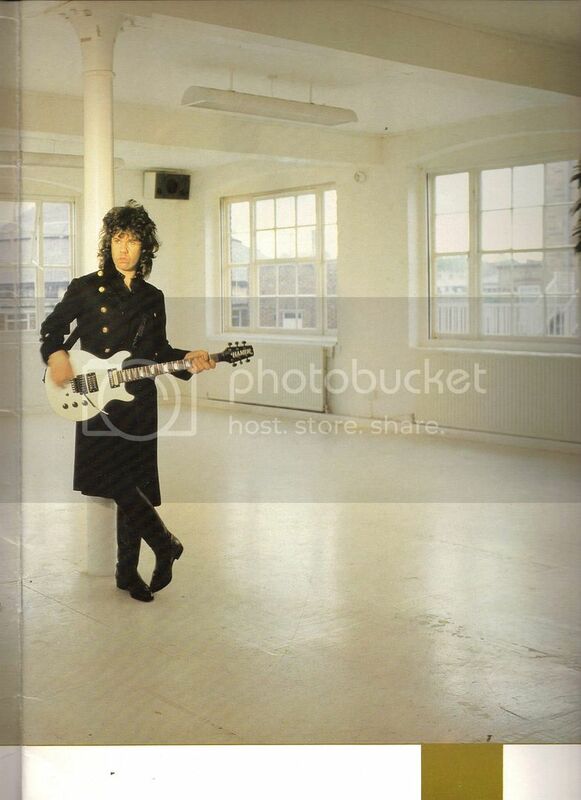 Hard to find the original better quality and longer version, track is over 15 minutes long! 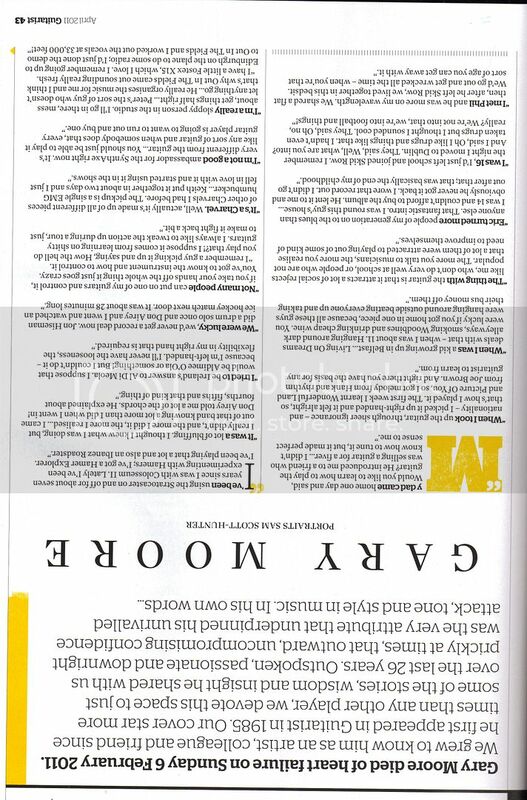 This one is poor quality copy of a copy.. I had a mini Marshall stack like that but had to sell it relunctly along with one otheramp and three guitars..but had to keep going. Last edited by Emerald; 05-01-2013 at 06:24 AM.